Kava is renown throughout Oceania as an amazing aphrodisiac. Perhaps it's because of the inhibition-lowering and sociability effects of Kava, perhaps it's because it can help increase feelings of well-being. Whatever the reason, we expertly combined other herbs known to support the sexual and relaxing effects of Kava. The result is our super-popular KavaLOVEtone Capsules. Our "KavaLOVEtone Capsules" are made by skillfully combining a dried, liquid macerate of a kavalactone-rich extract of kava root and several other herbal extracts with a long history of use in either social gatherings or sexual encounters. 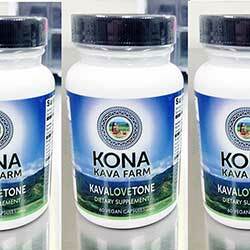 Concentrated and conveniently encapsulated, we feel these are deserving of the Kona Kava Farm name. With a touch of Horny Goat Weed, Damiana and Tribulus Terrestris to boost the sexual side, with some Calamus to give it a kick, and Sceletium and Hops to help increase the relaxation aspect of this product. With a growing list of happy customers, we couldn't be more pleased with this unique product, formulated in our labs for nearly a decade now. This is an exceptional, relaxing product and sexually energizing* herbal blend that combines an extract of kava root rich in kavalactones with some of the purest extracts from some of the most sexually stimulating and relaxing botanicals available. This herbal combination promotes a pleasant repose that lasts much longer than expected* and has quickly become a Top Seller. These capsules contain extracts of Hops, Kava, Damiana, Tribulus Terrestris, Blue Lotus, Calamus Root, Horny Goat Weed, and Full Spectrum powders of Sceletium, Velvet Bean, and St. John’s Wort.